It’s a rainy Wednesday night and Opium is the place to be with four bands waiting to hit our ear drums with loud noises. Next, Bianca take to the stage. They are co-headlining the tour with Inuit, but they have chosen to go on second on this particular date. Before they even start, they introduce themselves, which is good, as some people may not have known about the change in the lineup. They have a beautifully strong start with pleasant vocals perfectly thrown into the mix. The first song is short, but sweet and gives an excellent example of what is yet to come. When they play a song called Sway, Darren Gibson (Inuit) tells me it’s their best song and I can immediately see why. A slow start with pretty beautiful vocals laced and intertwining around the music. You can find it on their bandcamp page here. Now for Inuit, the 3-piece band from Glasgow caught my eye a few months back when they played in The Wee Red Bar (Edinburgh). There is a beautiful quote by Andy Johnson from a band called Windsor Airlift, which I think sums up how I feel about Inuit’s music. 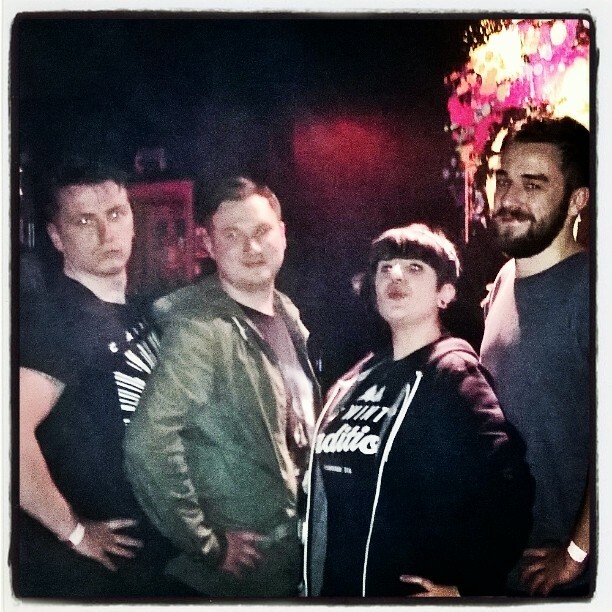 I managed to snap a wee photo with the guys from Inuit after their set, pulling their best “duckface”.